Belgrade has a lack of public swimming facilities. Well, I suppose one could take a dip in the Sava or Danube–both of which look tempting at a distance–but you would have to dodge the floating cafes, floating litter, Wels catfish, and human feet. The last two items of the list of reasons to avoid swimming near Belgrade were contributed by Quentin. He has been a little preoccupied with man-eating fish lately (thank you Animal Planet). So! This leaves you with a serious summer vacation challenge. Fortunately, public drinking fountains are everywhere. Please do not picture shallow stainless steel sinks and droopy arcs of tap water. Belgrade water fountains are a real institution. They come in all shapes and sizes and attract crowds of satisfied Serbs all day long. We were leery of these fountains last year, but now happily drink and splash the cool, clear water just like the locals. It is hard to explain, but we have a good time at these fountains. Who needs beaches of soft sand or luxurious resort swimming pools? 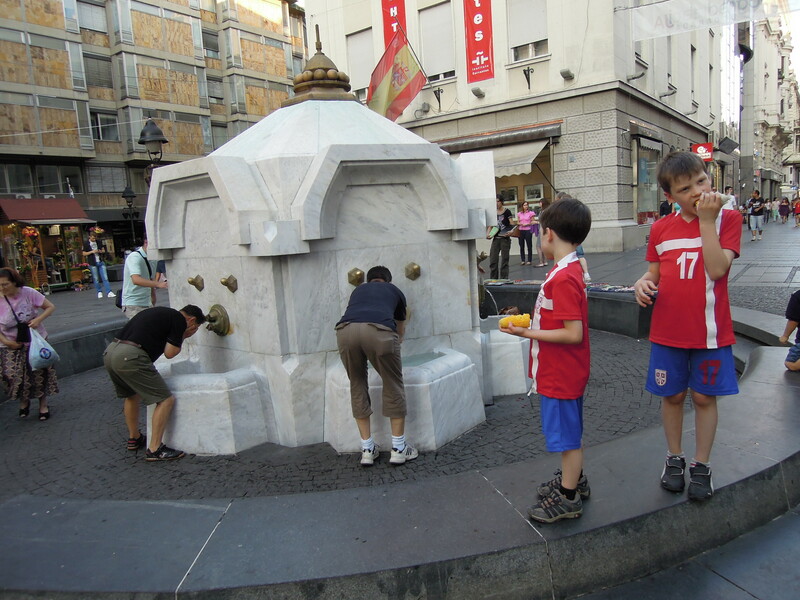 The public drinking fountains of Belgrade are sure to put a smile on your face. Between the drinking fountain visits, ice cream is always nice on a hot day. Especially for 60 dinars a cone. Or maybe a Popsicle for 40 dinars. Remember that the Serbian dinar is roughly equivalent to our Canadian penny. We literally walked from one stand to another,keeping up spirits and blood sugar levels while doing a little sight-seeing in the sweltering heat. The kids were a little apprehensive about climbing on the tank collection at the Kalemegdan military museum this year. Wasps like them too, for some reason. We made fun of the small Italian tank, looking miserable in its tacky bean-patterned camo, and we marveled at the placement of Cyrilic graffiti way up on the fortress clock tower. How did they manage it? Spray can on an extendable pole? Acrobatic tower of no-goodniks? Portable scaffolding? And what did it say, exactly? We actually went into the fortress museum this year in the hopes that it was air-conditioned (it was not). It was really interesting, actually…full of ancient artifacts and illustrated maps of warfare, burning civilizations and death. We got as far as World War 1 when Quentin and Landon needed a toilet. Unfortunately, the only toilets available were the squat-over-a-hole variety. And Landon and Quentin are not yet at the stage where using such a toilet is cool. So, that was the end of our museum visit. We went off on a hunt for modern toilets, starting the cycle of fountain visits and ice cream eating anew. It was a great day, topped off by a relaxing evening of ice cream eating and fountain visits. Plus a little rakia consumption for the adults.